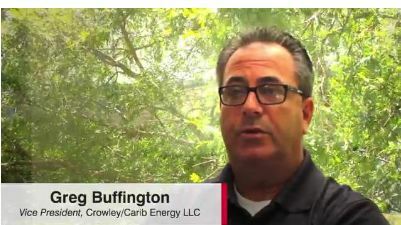 In this short video, Crowley Maritime Corporation‘s Greg Buffington, vice president of company subsidiary Carib Energy, explains the benefits of switching to reliable, safe, U.S.-exported liquefied natural gas (LNG) for industrial and commercial consumers in the Caribbean. Those who can benefit from adopting this affordable and eco-friendly power source include resorts and hotels, manufacturing companies, bottling plants and other industrial and commercial organizations. More: Have you not booked your cheapest Cruise trip yet? 1) What is LNG and how is it used? 2) Who is the ideal consumer for industrial LNG in the Caribbean? 3) What are the advantages to consumers? 4) What’s needed for a consumer to make the switch? 5) What should a consumer look for in a supplier when considering the switch to LNG? Crowley entered into the LNG market earlier this year with the acquisition of Carib Energy LLC. Florida-based Carib Energy, founded in 2011, was the first company to receive a small scale, 25-year, LNG export license from the U.S. Department of Energy (DOE) for LNG transportation from the U.S. into Free Trade Agreement (FTA) countries. While Crowley’s overall strategic focus on the LNG market spans several of its diversified business lines and leverages its storied history and success in the marine, project management, energy and transportation fields, Carib Energy has provided the company with an introduction into the emerging energy market from which the company can grow its concentration on LNG transportation. Crowley now serves the LNG market through LNG vessel design and construction; transportation; product sales and distribution, and full-scale, project management solutions. While Carib Energy has a pending U.S. Department of Energy application to supply LNG transportation services into non-FTA countries, its current licensing allows them, and now Crowley, to supply cost-efficient, environmentally friendly LNG from the U.S. to both commercial and industrial customers within the Caribbean and Central and South America – all countries where LNG is an attractive commodity thanks to its low price point in the face of growing power supply costs. Carib Energy is also cementing its involvement in future LNG fuel bunkering for ships transiting between the U.S. and Caribbean markets. LNG, or liquefied natural gas, is natural gas that is cooled to -260° Fahrenheit until it becomes a liquid and then stored at essentially atmospheric pressure. Converting natural gas to LNG, a process that reduces its volume by about 600 times allows it to be transported. Once delivered to its destination, the LNG is warmed back into its original gaseous state so that it can be used just like existing natural gas supplies. When returned to its gaseous state, LNG is used across the residential, commercial and industrial sectors for purposes as diverse as heating and cooling homes, cooking, generating electricity and manufacturing paper, metal, glass and other materials. LNG is not stored under pressure and it is not explosive. LNG vapors (methane) mixed with air are not explosive in an unconfined environment. When exposed to the environment, LNG rapidly evaporates, leaving no residue on water or soil. Posted by maritimenews on August 3, 2013. Filed under All news, Business, Company News, Latest news, World. You can follow any responses to this entry through the RSS 2.0. Both comments and pings are currently closed.